On August 28, 1930, Prohibition Agent Ray Sutton disappeared in New Mexico and his body has never been recovered. Deputy Sheriff Fletcher of Raton, NM, was the last known person to see Agent Sutton alive. He drove past Agent Sutton, who was standing beside his Government vehicle seven miles south of Raton, near Dawson Fork. They waved a greeting to each other and it was assumed by Deputy Fletcher that Agent Sutton was waiting for someone, "probably an informant." When several days passed and Agent Sutton did not check in, his supervisors became concerned. A search of his room at the Hotel Seeburg found his personal effects, records and clothes intact. In fact, his daily diary listed his arrival in Raton on August 27, 1930. A massive, albeit unsuccessful, search was undertaken by Federal and local authorities. On October 20, 1930, Agent Sutton's Government car was found in a deep, well hidden canyon 20-30 miles southeast of Raton. Bloodstains were found on the carpet in the back seat area. The investigation of Agent Sutton's disappearance and (assumed) murder intensified. Numerous suspects were interviewed and leads were pursued across the western portion of the United States. In December 1930, agents arrested Perry Caldwell in Pueblo, CO, for forging a Government pay check issued to Agent Sutton. Caldwell was also found in possession of Agent Sutton's Masonic identification card and a search of Caldwell's hotel room uncovered a Masonic ring agents believe belonged to Agent Sutton. The investigation also showed that Caldwell had paid off considerable debts shortly after Agent Sutton's disappearance, despite not having any gainful employment or legitimate source of funds. Because agents lacked sufficient evidence to charge Caldwell with the murder of Agent Sutton, he was charged with forgery and uttering of a Government check. The United States Secret Service identified the handwriting on the back of the check as Caldwell's, and a hotel clerk identified Caldwell as the person that cashed that check. However, at trial the hotel clerk changed his original story and could (would) not identify Caldwell. Investigators believed that he was threatened by the bootleggers. Despite overwhelming circumstantial evidence against him, Caldwell was not convicted by the jury. Despite a massive search and intensive investigation for over 10 years, Agent Sutton's body was never found. 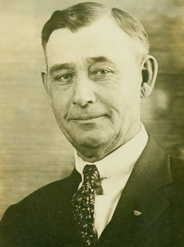 Agent Sutton was a well-recognized and courageous agent, respected by law enforcement and feared by bootleggers operating in the New Mexico/Colorado area. His disappearance and death is believed closely associated with the murder of Prohibition Agent Dale Kearney, who was killed one month earlier in Colorado. The same gang is believed responsible for both agents' deaths. 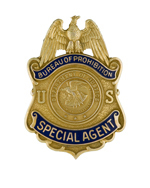 Agent Sutton joined the Prohibition Unit on August 19, 1923, with an annual salary of $1,800. He carried badge #2400. Previously, he was the Sheriff in Clayton, NM. Agent Sutton was born in Platteville, IA. He was survived by his wife, Margaret; their son, Ray George Sutton; and a married daughter, Nello May Means. Agent Sutton last resided in Clayton, NM.